I’ve always been surprised when I drive through the towns surrounding Lake Minnetonka. 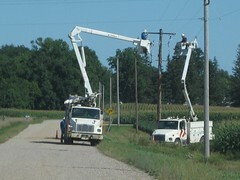 They seem to have a different feel to them–not suburban, not rural, but like a resort town. I’ve always enjoyed driving these twisting, turning routes because it’s like I went far away without crossing the state line. I wasn’t entirely surprised, then, when we ventured off Highway 7 into downtown Excelsior, Minnesota. Within a few blocks, we were off the busy road and into a quaint downtown area with unique shops, interesting restaurants, and a main street that leads right up to the lake. People everywhere were walking and biking, with friends, alone, with pets. It reminded me a lot of a smaller-scale Mackinac Island or Bar Harbor, Maine, with breezes coming off the lake, people wandering in and out of stores, and restaurant patios filled with people enjoying the day. Banners across the street advertised “Girls’ Nights Out” throughout the summer, which I’m going to recommend to my friends as a nice outing in the future. I was very pleasantly surprised to find this area. All it took was a turn off the beaten path. 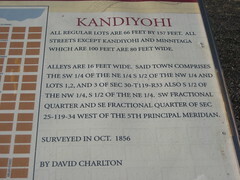 Do you know of any great places that the main roads have passed by? I’d love to hear about them! Where will the signs lead you? We’re backroads people. If we have to get there quick, sure, we’ll use the Interstate, but if time isn’t important, or if we want to avoid going through towns, we head for the county roads and find a scenic route. Even better, sometimes we find something that’s really off the beaten path that’s a very pleasant surprise. This was the case on a recent trip. We were only an hour and a half from home, but deviated from our usual route. (Actually, we don’t have many “usual” routes because I love to see as many different things as I can.) Hubby had a certain county road in mind, so we headed for it. 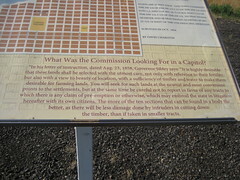 Along the way, though, I spotted a sign that intrigued me. 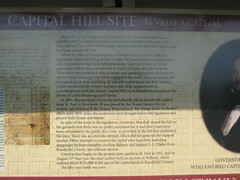 It said “Capitol City” and pointed us down another road. “Capitol City?” I thought? 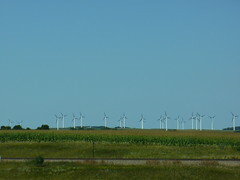 Out in the middle of rural Minnesota? We followed the sign, which led us six or seven miles and around a few more corners, ending up on a spot on a gravel road that overlooks two lakes. 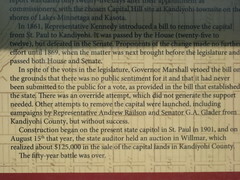 There we found it, a piece of Minnesota history I’d never heard of. 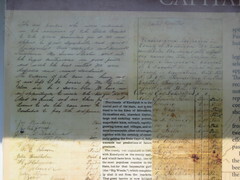 It wasn’t a city, or even any buildings, this Capitol City. 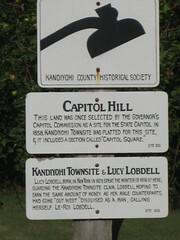 Instead, we found a series of signs that detailed a capitol city that almost was. 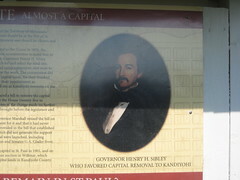 St. Paul was originally set up to be the temporary capitol of Minnesota, so Governor Henry Hastings Sibley sent out a party of searchers to find an ideal location. 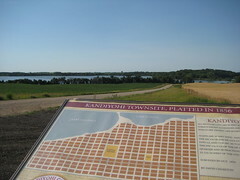 They recommended this site in Kandiyohi County. 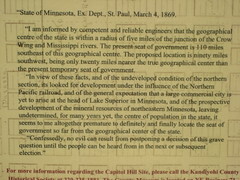 It went through some political twists and turns, and at one point was actually slated to become the new capitol, but the order was repealed by the next governor. 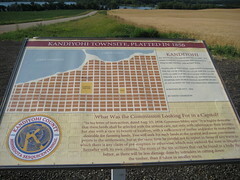 The plats had been laid out, with the capitol atop the hill and a town on the shores of the nearby lakes. 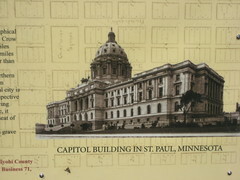 It led me to wonder how different our state would be with the capitol in Capitol City instead of St. Paul. 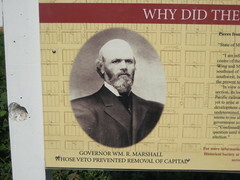 How would it have affected rural development? How would the Twin Cities be different? 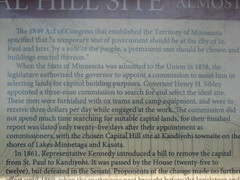 One can only wonder, because the state capitol stayed in St. Paul, and all that remains of Capitol City are the markers and documents that describe what it was to be. 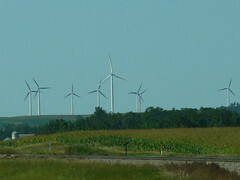 On our latest trip to Iowa, we got up close to some of the many windmills on the Buffalo Ridge in southwest MInnesota. 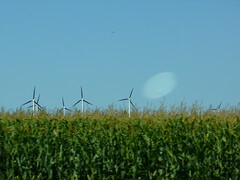 The windmills go on for miles and miles, quiet giants waving their arms over the prairie. 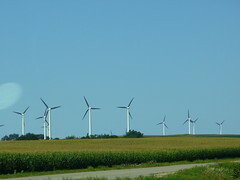 The kids always are excited when we see a windmill on a drive, and to see so many was absolute excitement for them! To see more Photo Friday travel photos, head to DeliciousBaby. There are days when we don’t have to go very far for excitement. 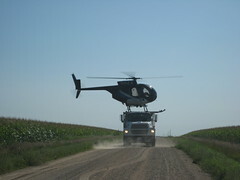 One morning in August, we were on our way to return books at the library when we came upon this spray ‘copter reloading. It was in the middle of our road, so we had to stop and wait for it. Boy, that’s tough for kids, to have to sit and watch a helicopter up close . 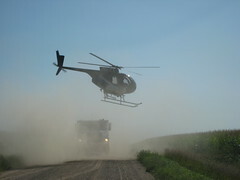 . . and then take off from the truck. We dropped off our books and headed to see Grandma, when we came upon this in front of her house. To an adult, a mere annoyance, but to the kids, a lot of interest added to their day! 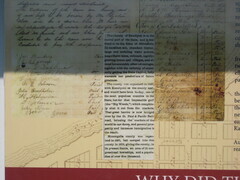 What interesting things have you seen in your own neighborhoods?